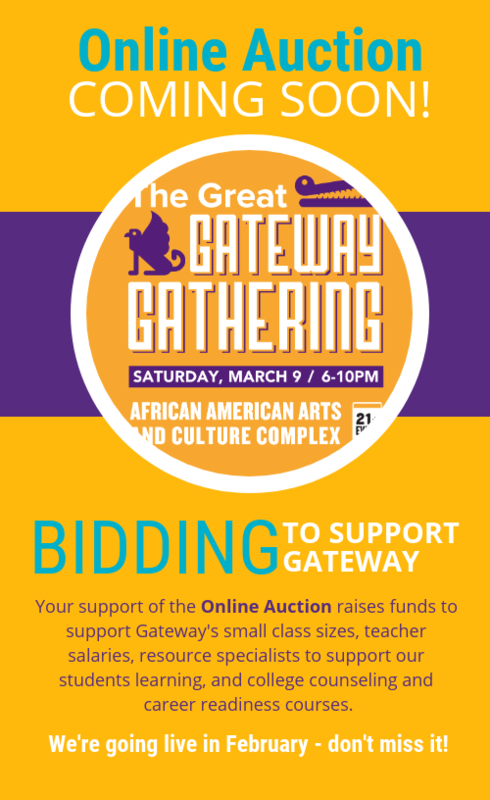 Thank you for donating an auction item to the 2019 Great Gateway Gathering, and for supporting our schools' mission, students and teachers! If there is a gift certificate or other tangible item associated with your donation, please tell us in the Notes section how you will get it to Gateway before the event. Thank you! Are there any restrictions associated with this donation (dates/times, number of people, time of year, etc.)? Need Help Making Your Donation? We're happy to help you offline! Please contact Cathy Yee, 12 grade parent and volunteer extraordinaire, at cathypy1@gmail.com. Where to bring your donations: Please deliver any gift cards or other tangible items to Gateway High's Main Office by Friday, February 8. Please note: We are unable to accept donations of used household or personal items. Due to space and capacity, our committee may decline donations of tangible items that we don't believe will "sell" in the auction. Thank you for your consideration! For questions related to the Great Gateway Gathering, please contact Chanda Guerin, Director of Development and Outreach for Gateway Public Schools at cguerin@gatewaypublicschools.org.